Of all the services we offer to our Calgary-area patients, few elicit as many questions or as much excitement as porcelain veneers. People have often read up on porcelain veneers, and they want to know if veneers are right for them. The excitement and curiosity are understandable. Porcelain veneers really do represent a wonderful option for many patients. They have a lot of advantages over other possible treatments, and that makes them very interesting to patients. Still, it's always important to get the right treatment, not the most exciting. At Evolution Dental, you can count on Dr. Schick and our staff to carefully evaluate your teeth and determine if veneers are right for you. 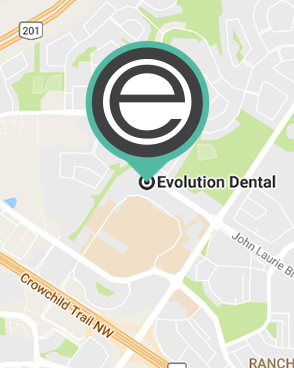 If you live in or around Calgary, Alberta and you have questions about porcelain veneers, please call Evolution Dental today at 403-768-2422 for a consultation and examination. When Are Porcelain Veneers Appropriate? Porcelain veneers are thin, custom made ceramic coverings that are bonded to the front surfaces of teeth. This might not sound particularly impressive, but these thin ceramic cases can actually effect an extraordinary transformation in the quality of your smile. The first step in determining if you should opt for porcelain veneers is simply figuring out if your problems and concerns are among those that can be addressed by veneers. If they are, then you might be a good candidate. Of course, there are usually other options for treating the problems listed above. However, we have found that veneers represent an option that many patients find simply irresistible. Durability: Porcelain veneers are very durable and usually last for many years. We use only the best materials to craft and bond your veneers. You can increase their longevity by brushing and flossing regularly, coming for regular examinations and hygiene visits, wearing a mouth guard during sporting activities, and a night guard if you grind or clench your teeth. If accidental damage does occur, we can usually replace only the veneer involved. Inconspicuousness: With current technology and materials, porcelain veneers are virtually undetectable. They are made completely out of porcelain (no metal or greying), mimic natural tooth translucency and light reflection, and blend seamlessly at the margins. We want you to look like you have a great new smile while no one else can tell you have veneers. Simplicity: Finally, with veneers, you don't have to worry about what you eat or drink after they are bonded to your teeth. You should always eat a healthy diet, of course, but you don't have to be concerned that your veneers won't be able to handle certain foods. You can eat what you love. Again, the only way to know for sure if veneers are right for you is to make an appointment and undergo an examination. We'll help you find the right course of action. Looking for a way to improve your smile? Contact Dr. Kendra Schick by calling Evolution Dental at 403-768-2422 today to discuss your candidacy for porcelain veneers. We are pleased to serve patients throughout the Calgary area, nearby communities like Cochrane and other parts of Alberta.